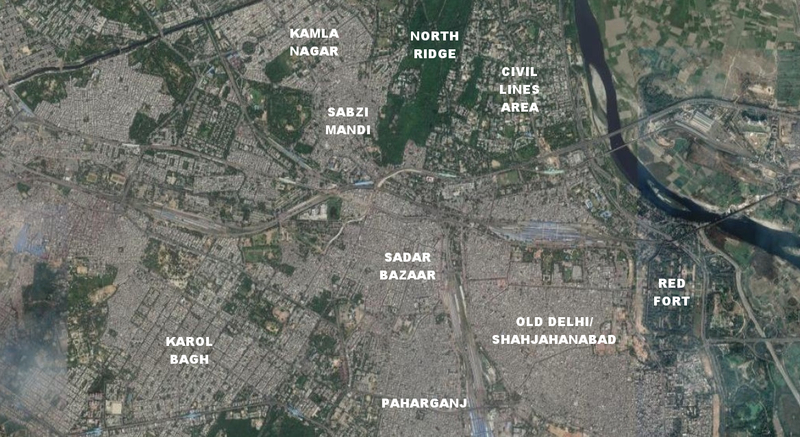 This is the first in a series of posts exploring buildings and neighborhoods mostly from the 1930s to 1950s in areas in Delhi such as Paharganj, Sadar Bazaar, Jhandewalan, Karol Bagh, Kamla Nagar and Jawahar Nagar. 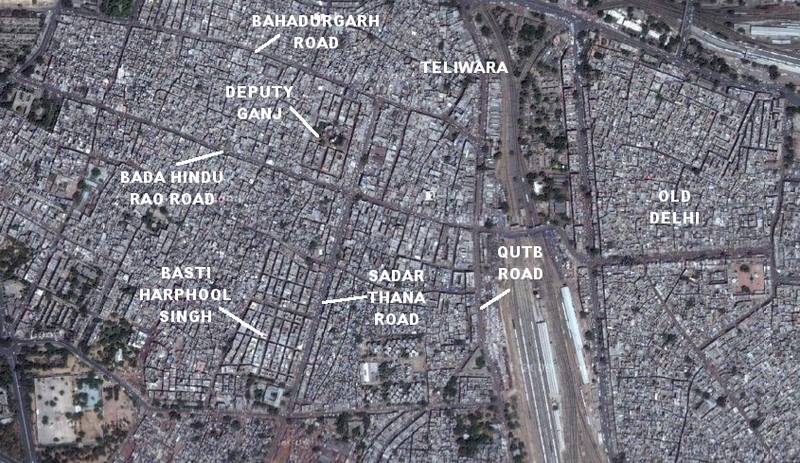 These areas are located to the west of Old Delhi/Shahjahanabad. Much of the building stock in these areas is in the desi deco style that I have covered before. Buildings made in the 1950s and later start moving to a more restrained modernist style. I visited these areas a few years ago, but haven’t gotten down to posting these photos till now. Most of the photos in the series were taken between November 2008 and June 2010. The walled city of Shahjahanabad was built in the 17th c as the new Mughal capital. By the 19th c localities such as Sabzi Mandi, Sadar Bazaar and Paharganj to the west of Shahjahanabad had started to urbanize. 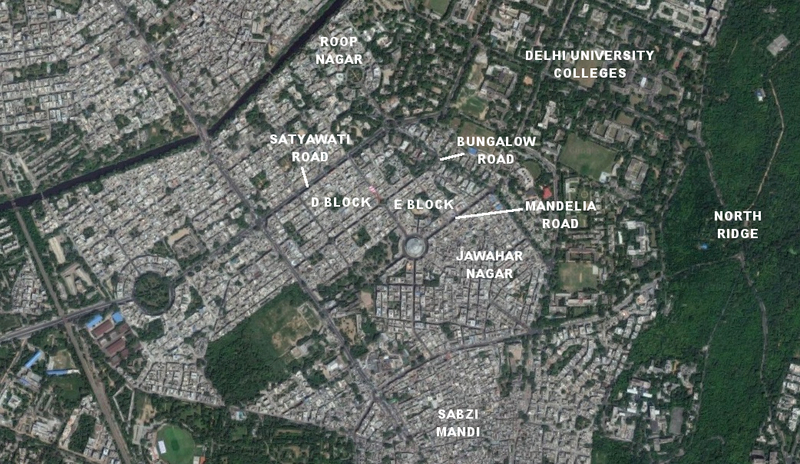 At the same time British influence continued to grow in the 19th c, and they built their Civil Lines to the north of the city, and then moved their cantonment further north (where Delhi University now has its colleges). In the second half of the 19th c, the railways cut through northern Shahjahanabad (today’s Old Delhi railway station), and then slowly started expanding along the western edge of the walled city, between the city to the east and neighborhoods such as Sadar Bazaar and Paharganj to the west. This is why today’s New Delhi railway station is located on the western edge of Shahjahanabad and separates the walled city from Sadar Bazaar and Paharganj. Delhi was (once again) becoming commercially important in north western India, and near the end of the 19th c many schemes were proposed to expand the city to the west in a planned manner, to reduce the congestion of Shahjahanabad. These plans mostly only took off in the 1920s, and the residences we see today date from the 1930s to the 1950s. 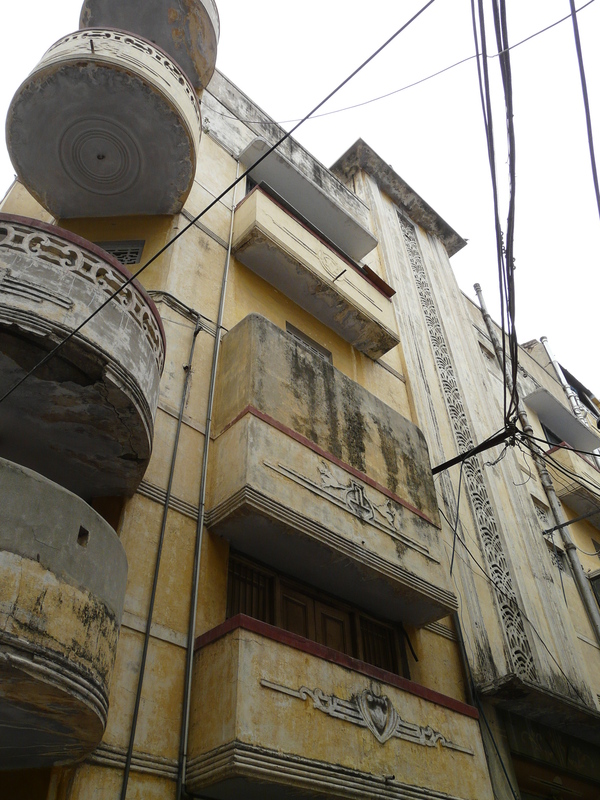 This area, west of Shahjahanabad, is often overlooked when discussing the modern architectural history of Delhi, even though the buildings it contains are a record of a 20th c idea of modernity in architecture that was in vogue before modernism took hold in Delhi and elsewhere in India. The buildings often combine designs and motifs from art deco, colonial neo-classicism, indigenous traditions and haveli architecture. 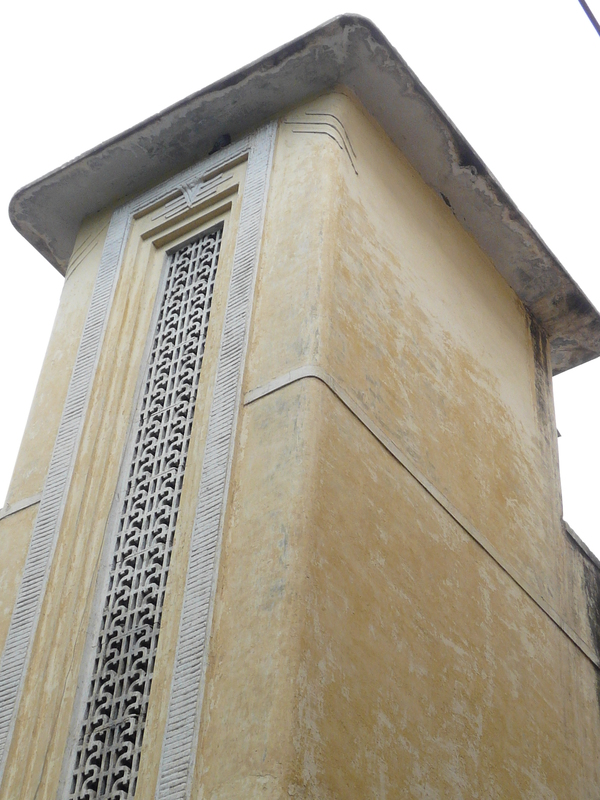 The indigenized art deco that I call desi deco is as fascinating here as it is in neighborhoods such as Daryaganj in the walled city, which is not a coincidence since this building stock in all these neighborhoods came up contemporaneously. In the 1920s, 30s and 40s, Shahjahanabad (which the British had renamed Old Delhi to differentiate it from the New Delhi they were building to its south) was filled to the brim and overcrowded, and New Delhi was built only for the British, for a handful of Indian royalty and for the Indian clerical and support staff of the Raj. There was no place in Old and New Delhi for well-to-do merchants who wanted residences that displayed their wealth and modernity. So they bought plots in these western suburbs and built their houses here. 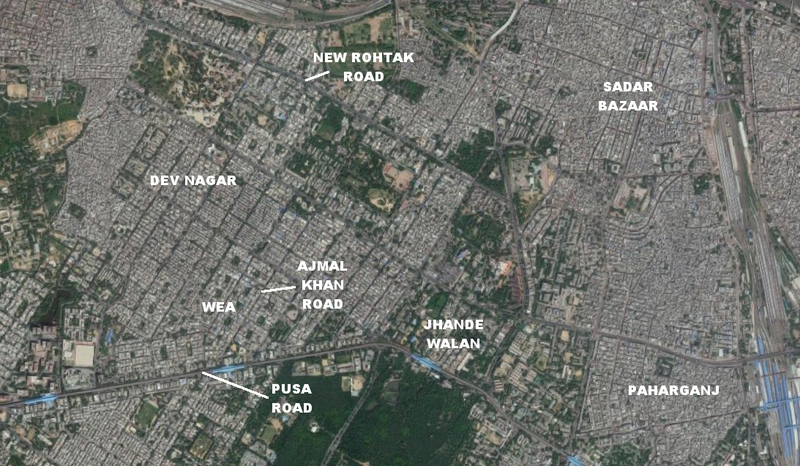 As the 1950s and 60s progressed, the focus of development shifted to south Delhi and further west, and this part of the city was left in a sort of limbo, with interestingly designed neighborhoods and houses but without too much development pressure. This has preserved a lot of the buildings from the 1930s to 50s era, though mostly not well maintained. Development pressure is catching up though, and much of this building stock could be lost soon. The maps below locate the neighborhoods that will be covered in the series. In the current satellite images it is often possible to make out the planned neighborhoods from the 1920s and 30s among the earlier (late 19th c and early 20th c) more haphazard growth. 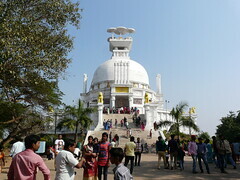 Gupta, Narayani. 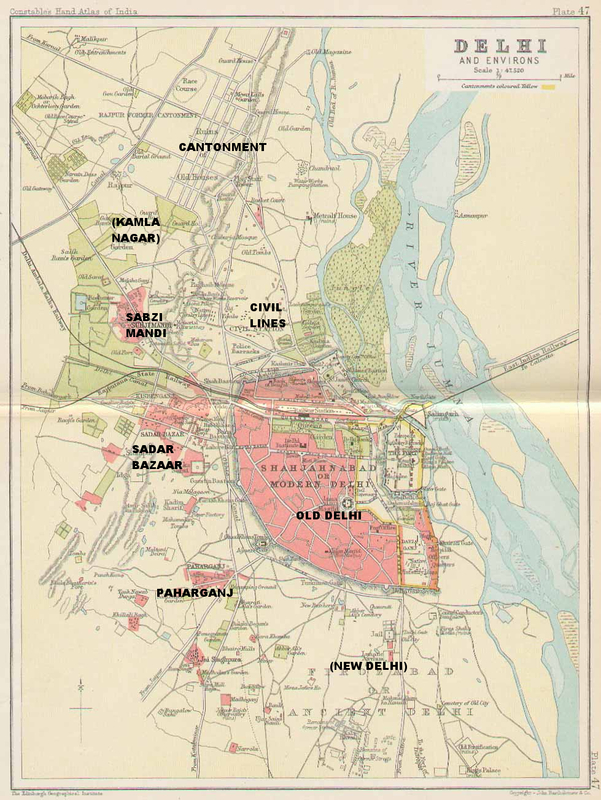 Delhi Between Two Empires 1803-1931: Society, Government and Urban Growth. Oxford University Press, 1981. 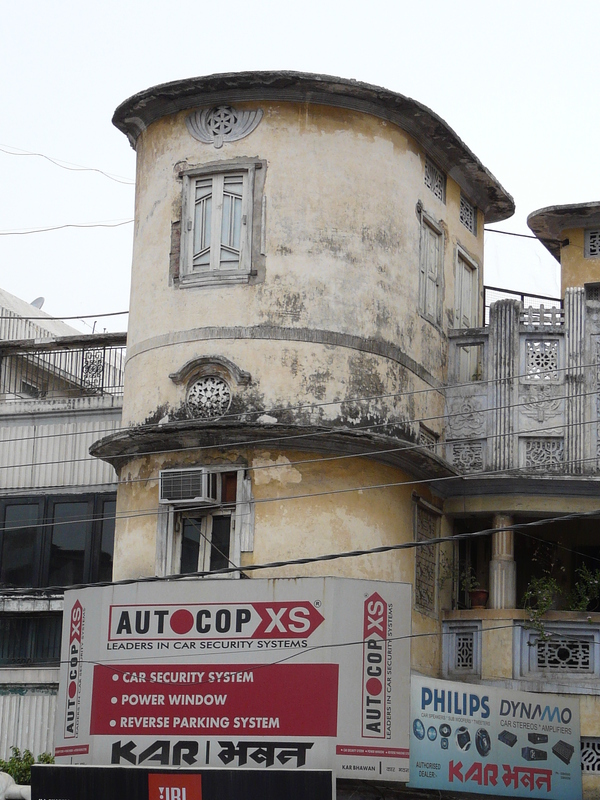 This entry was posted in Delhi, Mid-20th c Delhi and tagged ajmal khan road, art deco, basti harphool singh, delhi, deputy ganj, desi deco, dev nagar, jawahar nagar, jhandewalan, kamla nagar, karol bagh, mid 20th c architecture, old delhi, pahar ganj, pusa road, ram nagar, roop nagar, sadar bazaar, sadar thana road, shahjahanabad, western extension area. Bookmark the permalink.